This is a mixed media piece I created a few weeks ago. I was thinking of adding more to it, but then I realized I am happy with it the way it is. The inspiration came for it when I was in an artistic and playful mood one day. First, while I was looking through images of birds, I fell in love with one bird in particular. I thought he looked like he should be swooping down and grabbing a fish. So, I decided to add pictures of the bird and four fish to a watercolor-painted sheet of paper I prepared the night before Then, I thought it would be humorous to make a slight political statement by drawing a comparison between the bird and Marie Antoinette. 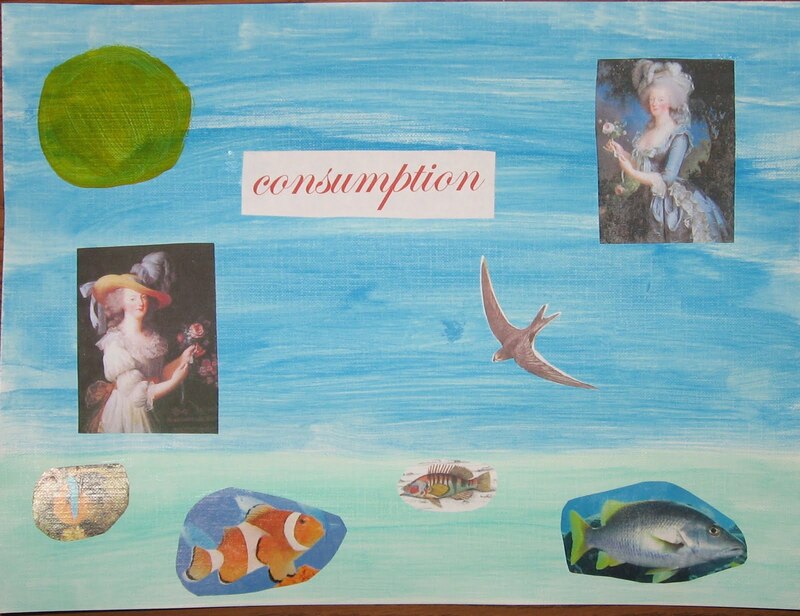 Once I thought of this comparison, the word "consumption" immediately came to my mind as an encompassing term.I added two portraits of Marie Antoinette, along with the word "consumption." I finished the piece by using acrylic paint to paint a yellow sun.